Species have often adapted to changes in their physical environment, but never before have they been expected to do it so fast. Last year in Paris, for the very first time, English sparkling wine beat champagne in a blind tasting event. Well established French Champagne houses have started buying fields in Britain to grow grapes, and even the royal family is investing in this new venture. At the same time, coffee-growing regions are shrinking and shifting. Farmers are being forced to move to higher altitudes, as the band in which to grow tasty coffee moves up the mountain. The evidence that climate change is affecting some of our most prized beverages is simply too great to be ignored. So while British sparkling wine and the beginning of the “coffeepocalypse” were inconceivable just a few decades ago, they are now a reality. It’s unlikely that you’ll find many climate deniers among winemakers and coffee connoisseurs. But there are far greater impacts in store for human society than disruptions to our favourite drinks. Dramatic examples of climate-mediated change to species distributions are not exceptions; they are fast becoming the rule. As our study published last week in the journal Science shows, climate change is driving a universal major redistribution of life on Earth. These changes are already having serious consequences for economic development, livelihoods, food security, human health, and culture. They are even influencing the pace of climate change itself, producing feedbacks to the climate system. Species have, of course, been on the move since the dawn of life on Earth. The geographical ranges of species are naturally dynamic and fluctuate over time. But the critical issue here is the magnitude and rate of climatic changes for the 21st century, which are comparable to the largest global changes in the past 65 million years. Species have often adapted to changes in their physical environment, but never before have they been expected to do it so fast, and to accommodate so many human needs along the way. For most species – marine, freshwater, and terrestrial species alike – the first response to rapid changes in climate is a shift in location, to stay within their preferred environmental conditions. On average, species are moving towards the poles at 17km per decade on land and 78km per decade in the ocean. On land, species are also moving to cooler, higher elevations, while in the ocean some fish are venturing deeper in search of cooler water. Different species respond at different rates and to different degrees, with the result that new ecological communities are starting to emerge. Species that had never before interacted are now intermingled, and species that previously depended on one another for food or shelter are forced apart. Why do changes in species distribution matter? 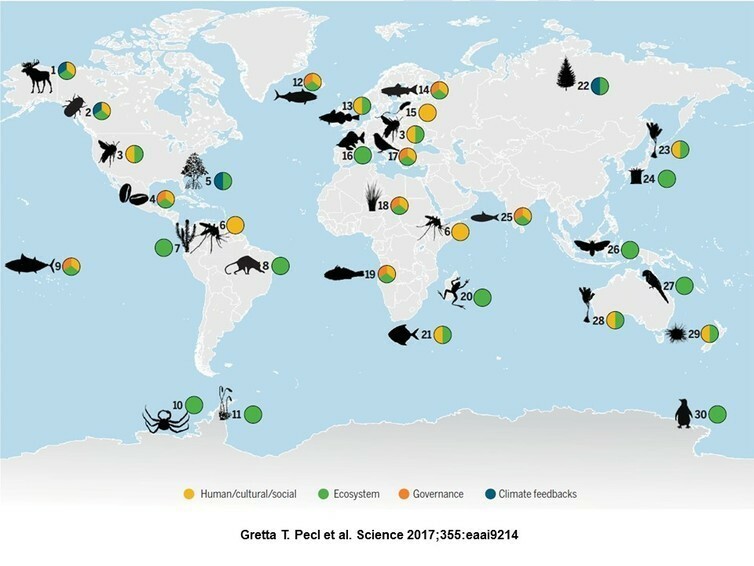 This global reshuffling of species can lead to pervasive and often unexpected consequences for both biological and human communities. For example, the range expansion of plant-eating tropical fish can have catastrophic impacts by overgrazing kelp forests, affecting biodiversity and important fisheries. In wealthier countries these changes will create substantial challenges. For developing countries, the impacts may be devastating. Many changes in species distribution have implications that are immediately obvious, like the spread of disease vectors such as mosquitoes or agricultural pests. However, other changes that may initially appear more subtle can also have great effects via impacting global climate feedbacks. Mangroves, which store more carbon per unit area than most tropical forests, are moving towards the poles. Spring blooms of microscopic sea algae are projected to weaken and shift into the Arctic Ocean, as the global temperature rises and the seasonal Arctic sea ice retreats. This will change the patterns of “biological carbon sequestration” over Earth’s surface, and may lead to less carbon dioxide being removed from the atmosphere. Redistribution of the vegetation on land is also expected to influence climate change. With more vegetation, less solar radiation is reflected back into the atmosphere, resulting in further warming. “Greening of the Arctic”, where larger shrubs are taking over from mosses and lichens, is expected to substantially change the reflectivity of the surface. These changes in the distribution of vegetation are also affecting the culture of Indigenous Arctic communities. The northward growth of shrubs is leading to declines in the low-lying mosses and lichens eaten by caribou and reindeer. The opportunities for Indigenous reindeer herding and hunting are greatly reduced, with economic and cultural implications. Not all changes in distribution will be harmful. There will be winners and losers for species, and for the human communities and economic activities that rely on them. For example, coastal fishing communities in northern India are benefiting from the northward shift in the oil sardine’s range. In contrast, skipjack tuna is projected to become less abundant in western areas of the Pacific, where many countries depend on this fishery for economic development and food security. Local communities can help forge solutions to these challenges. Citizen science initiatives like Redmap are boosting traditional scientific research and can be used as an early indication of how species distributions are changing. Having local communities engaged in such participatory monitoring can also increase the chances of timely and site-specific management interventions. Even with improved monitoring and communication, we face an enormous challenge in addressing these changes in species distribution, to reduce their adverse impacts and maximise any opportunities. Responses will be needed at all levels of governance. Internationally, the impacts of species on the move will affect our capacity to achieve virtually all of the United Nations Sustainable Development Goals, including good health, poverty reduction, economic growth, and gender equity. Currently, these goals do not yet adequately consider effects of climate-driven changes in species distributions. This needs to change if we are to have any chance of achieving them in the future. National development plans, economic strategies, conservation priorities, and supporting policies and governance arrangements will all need to be recalibrated to reflect the realities of climate change impacts on our natural systems. At the regional and local levels, a range of responses may be needed to enable affected places and communities to survive or thrive under new conditions. For communities, this might include changed farming, forestry or fishing practices, new health interventions, and, in some cases, alternative livelihoods. Management responses such as relocating coffee production will itself have spillover effects on other communities or natural areas, so adaptation responses may need to anticipate indirect effects and negotiate these trade-offs. To promote global biodiversity, protected areas will need to be managed to explicitly recognise novel ecological communities, and to promote connectivity across the landscape. For some species, managed relocations or direct interventions may be needed. Our commitment to conservation will need to be reflected in funding levels and priorities. The success of human societies has always depended on the living components of natural and managed systems. For all our development and modernisation, this hasn’t changed. But human society has yet to appreciate the full implications for life on Earth, including human lives, of our current unprecedented climate-driven species redistribution. Enhanced awareness, supported by appropriate governance, will provide the best chance of minimising negative consequences while maximising opportunities arising from species movements.